I’ve been telling you people for years, but you didn’t believe me. Why didn’t you believe me? This entry was posted in Games, Toys and tagged g.i. joe, metal gear, stupidity. Bookmark the permalink. Where did you get the Boss? Got her from Sideshow Toys. They made a 12-inch doll of the Boss? Impressive. I know there’s no right way to ask this, but does The Boss figure have the snake-shaped scar on her chest? Also, have any other Metal Gear characters recieved the G.I. Joe scale treatment? Anyway, I’ve always felt Metal Gear had more in common in tone with G.I. Joe than your typical army games. Yeah, it does get serious, but you don’t see too many other games in military themed settings featuring cyborg ninjas, flamethrower jetpack cosmonauts, electric Russians, gas mask wearing mad psychics, or walking tanks. Yeah, she actually ships with her sneaking suit unzipped to the navel, and the scar is present. 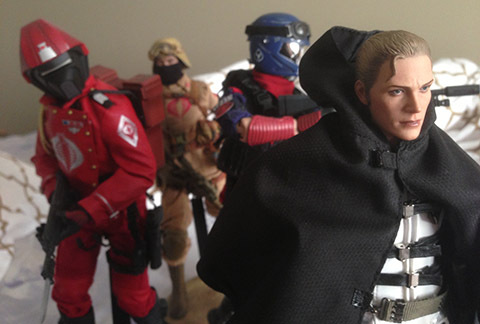 Hot Toys also made a Snake in the same scale, but it’s a Peace Walker version, which means he’s both in an ugly outfit and doesn’t really match The Boss.